As promised in my last post, I wanted to communicate WHY exactly I decided to sign on as a coach for Beachbody. It wasn't an impulse decision, but one that I've actually been pondering for quite a while. If you've been reading my blog for a while, you know that I have absolutely no reservations about using products on this journey. Whenever I read someone who likes to brag about not using "pills, wraps or shakes" or having an "all natural" weight loss (meaning no surgery), I usually roll my eyes. One thing I've learned after many years on this journey is that the products or method you use only works if you do the work. So use whatever tools you want! You're only wasting your own hard earned money if you're not willing to do your part. I just want me and everyone else to be successful. What ever it takes. My love affair with Beachbody started in 2007 when I ordered Slim in Six and completed the entire six week program. This was pre-blogging days, btw. I was captivated by the infomercial and decided to go for it. And it worked! Until the six weeks were up and I started binge-eating like crazy and gained all the weight back. This was WAY before I had accepted or even KNEW what food addiction was and that I had it. Fast forward several years. To the days of social media. I started following someone's blog (Yum Yucky) and then someone else on IG (Erika at MessyMomHustle) that were both beach body coaches. Both had an amazing transformations. Erika and her hubby would do these at-home workouts together and it looked like so much fun! I also knew Tara from the blog world (wortheveryounce). And then I started following another person, and then another, and another and they all used Beachbody products. Someone even sent me a sample of Shakeology once. I thought it was SO nasty because it wan't sweet enough (now I'm rolling my eyes at myself). But even though I saw the personal success (each of them! ), the transformations AND the fact that they all had thriving businesses, I always looked at them and didn't believe I could actually pull that off. So I continued to follow all of them on social media. And even several more! And I could see the continued personal results. But I could also see other things. One person I follow QUIT HER JOB and offers Beachbody full time. Another person, a stay at home mom, was just able to buy a new home because she had earned so much with her business they paid off all their debt. I continuously saw weight loss and maintenance. I always saw success. But what I didn't see is them SELLING anything at all. Their posts never looked like an infomercial for a product. It was never pushy. It sincerely looked like these people were happy with their Shakeology and home workouts and sincerely wanted to help people with their own transformation. About a year ago (when I started this blog as opposed to SkinnyHollie), I decided that I wanted to be an entrepreneur. I felt like it was one of those things that had been calling me for a while, but fear just told me was unattainable. I could see myself working from home. I could see myself spending more time with my children and family. And honestly, more time at the beach! After starting my teaching assignment here in Florida, I knew I was burnt out. I needed a change. I wanted to work at home. For myself. I signed up with Mary Kay in October and knew after a few months that wasn't it. I LOVE makeup, but it wasn't my passion. I asked myself that a million times. And as I stated in my last blog post, at some point after finding success with Keto this year, and becoming more active on social media, and actually trying to teach and HELP people with the knowledge I'd acquired... my passion became evident. It's serving. It's teaching. It's helping people become the best, most healthy version of themselves. It's allowing people to use me as a source of inspiration and motivation and accountability! Through helping others, I help myself. It makes me happy. It fills me in a way that I've never been filled before. While typing this I just got an amazing text from someone I've met on social media (through my Like page) and that is also now doing keto. She has already lost a lot of weight and inches! It's such great news and I just had to smile from ear to ear. I helped her. I was an example for her. And now she is getting healthy and leading her family by example. Yes, she is doing the hard work. But I feel so happy inside getting to watch her transformation!!! A month or so ago, the whole stay-at-home-wife-and-entrepreneur-mom thing started rolling through my brain again. It's summer, and instead of staying home with my kids, I went out and got a summer job. Yes, it was easy and fun and the pay was great. But I missed the summer with my kids. I only have two kids left at home. And they are turning into mini adults. Fast. Time is flying. What happened to my dreams? My plans of being a work from home mom? What could I do that would allow me to do something I'm passionate about AND make enough money that I could accomplishing that goal? One morning a few weeks ago as I was pondering this on my way to work, I ran across a podcast by Chalene Johnson. If you don't know who she is, then shame on you. (I LOVE HER). But she is the instructor on several Beachbody programs (TurboJam, Piyo...). I had subscribed to her podcast back in May (I think) because she had someone on her show talking about a low carb, high fat diet and lifestyle. So on this day, I was searching for something to listen to on my long ride to work and came across one of her shows on personal branding that REALLY got me thinking. The answer was in my face this whole time. Beachbody. It's a reputable company. EVERYONE knows about their products (duh, infomercials!) They are a leader in health and wellness. It's a brand I already trusted. I came home that evening and started following Chalene. Then I started going back and stalking everyone I follow on social media that's affiliated with Beachbody. I contacted my own Beachbody coach and started hammering her with questions. Her response... "Honey, you're already a coach. You just haven't made it official." But I still wasn't ready. So I dug out my PiYo dvd set that I'd ordered MONTHS earlier. After we moved, I knew I'd have space to workout at home and thought PiYo would be a good way to start. But it was more challenging than I expected. I did the first three days and it started collecting dust. I got busy and... all the other excuses. BUT, I was ready to give it another try. After the first or second workout, Chalene started talking about Shakeology after a workout segment. The word "probiotic and digestive enzymes" got me curious so started researching it AGAIN. Since going keto, I've been plagued by chronic constipation and hair loss. The reviews stated that Shakeology helped with BOTH. Definitely higher in carbs than I would have liked, but it actually looked like a good meal replacement. I could pronounce all the ingredients and it was (in my opinion) clean! So I ordered a sample pack. 7 days worth. So quietly, I tried it for a week. I only told a few people because LORD HAVE MERCY I didn't want the negativity. And guess what? I liked it. I adjusted my carbs (eliminating most of my dairy and my daily servings of pecans) so I could still keep my carbs around 25g daily. And within TWO days I was having daily bowel movements. AND my hair stopped shedding. Now, my hair had already decreased shedding significantly, but while drinking Shakeology it STOPPED. And it wasn't a fluke. Because after being OFF Shakeology for three days I'm already back to not having BM's at all. The Shakeo didn't make me bloat or have cravings. I was still able to maintain ketosis. My body liked them. And so did I. So, after all the research on the company. And being a guinea pig for the product. And actually doing one of the workout programs and seeing progress, and being excited about doing a few more (Cize!) I was ready to pull the trigger. But I was still scared. Until on Saturday morning and I logged on to Instagram and saw this picture. This is from Beachbody's annual conference, Summit, that was held in my hometown of Nashville last week and last weekend. 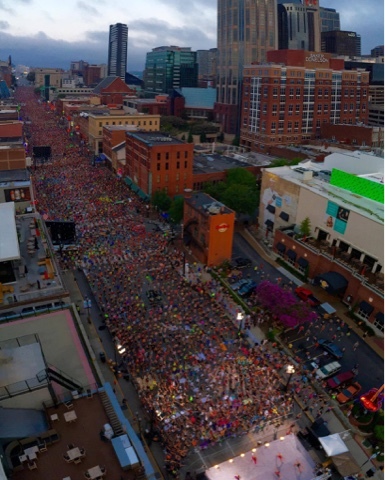 This picture is 25,000 people doing a group workout on Broadway downtown. I went to high school on Broadway. I know that area well. And to see THIS MANY PEOPLE working out, changing their lives, and so committed to a company... I just knew. This is where I'm supposed to be. It will be with the help of this company that I get to earn a living doing what I love to do. And it will also be through this company that I will finally realize my own weight loss and fitness goals. With the combination of my own knowledge of the ketogenic and low carb diets, and with the training and resources that Beachbody provides on clean eating and portion control, I can help SO many people. And I can also participate in and offer fitness programs to fit ANYONE's style and needs. Fitness that can be done from the comfort of your own home (no more driving to the gym or packing a workout bag). Someone commented on my last post that she hopes I don't turn my blog into just posts about product sales. Never have. Never will. What you will continue to see is my progress. My workouts. More about my eating plan. And if you see something that interests you, you can contact me! I'm not a sales person and don't want to be one. But I will help you reach your goals. With or without you purchasing products from me. Because that's what I do. That's my passion. It's what I believe God put me here for. All the starts and stops. All the struggle with gaining and losing weight. All the failures. All the damage I've done to my body. I see now that it was all part of a bigger plan. I'm exactly where I'm supposed to be. And now I'm doing what I'm supposed to do. My story, my testimony, will help others. I want us all to transform. Glad to hear it! ;-) good luck!